Dates: Weekly departures. 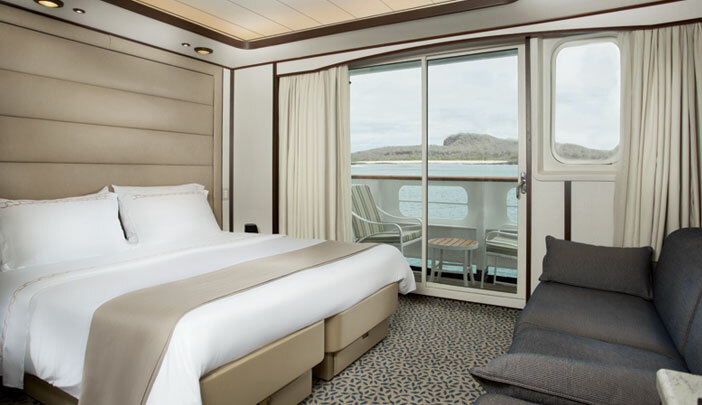 The Silver Galapagos offers 8-day cruises and extended 15-day cruises. Our Galapagos tours include a pre and post night in Quito or Guayaquil. 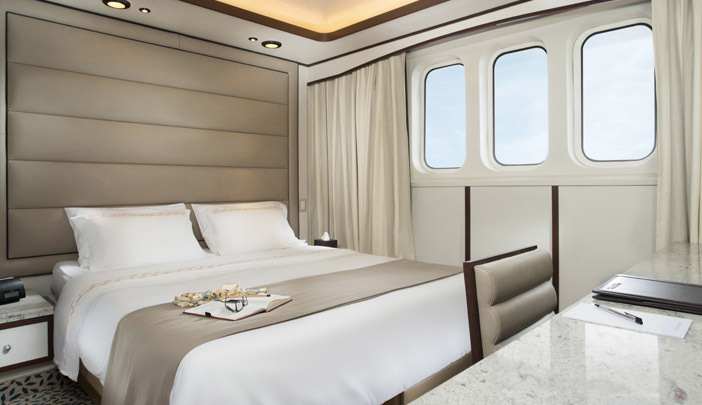 Deck 2: 7 Explorer Suites (cabins #246-#252) : Twin or queen-sized beds, sitting area, three portholes. 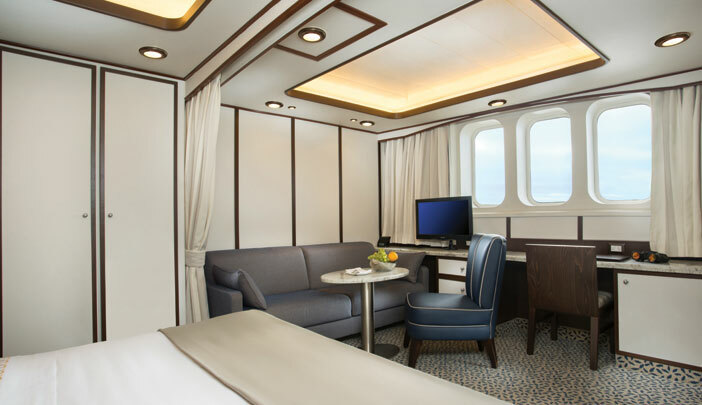 Average size: 225 sq ft.
Deck 3: 12 Explorer Suites (cabins #334-#345) : Twin or queen-sized beds, sitting area, picture windows. Average size: 243 sq ft.
Deck 4: 5 Explorer Suites (cabins #238-#431, #433) : Twin or queen-sized beds, sitting area, picture windows. Average size: 243 sq ft.
8 Deluxe Veranda Suites (cabins ##420-#427) : Twin or queen-sized beds, sitting area, private balcony with floor-to-ceiling glass doors. 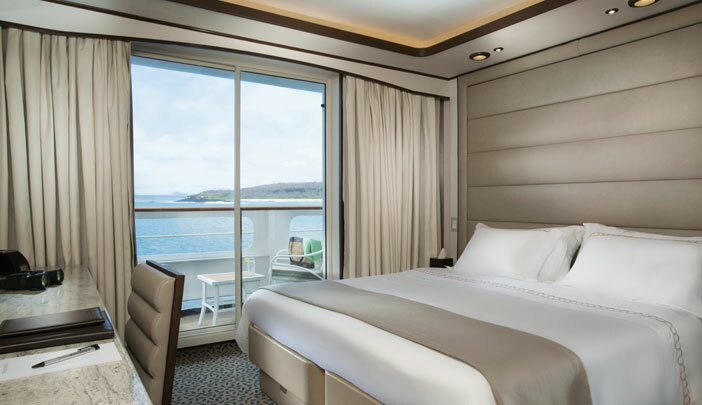 Average size: 303 sq ft.
Deck 5: 12 Veranda Suites (cabins #507-#512, #514-#519) : Twin or queen-sized beds, sitting area, private balcony with floor-to-ceiling glass doors. Average size: 268 sq ft.
2 Terrace Suites (#505, #506) : Twin or queen-sized beds, sitting area, large panoramic picture windows. Average size: 287 sq ft.
*Terrace Suites #505 & #506 and Veranda Suites #507, #508, #517, #519 can be triples. 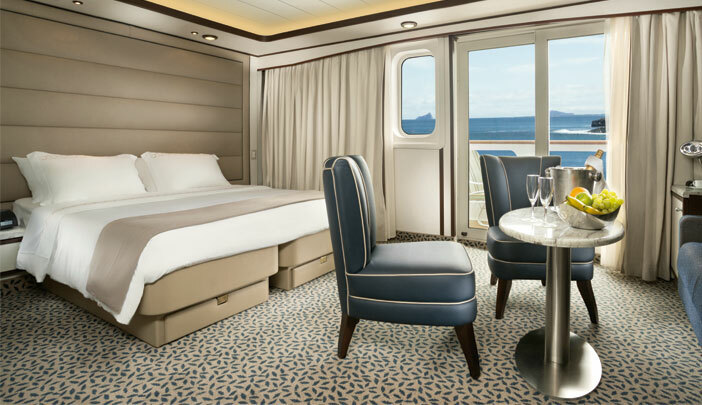 Deck 6: 4 Silver Suites (#601-#604) : Twin or queen-sized beds, sitting area, espresso machine, private balcony with floor-to-ceiling glass doors. Average size: 361 sq ft.